Blizzard Entertainment fans are geeks by raw nature. Some are very deep into collecting all kinds of licensed products including WoW TCG, plush toys, novels, comic books, WoW minis, board games, T-shirts, statues, dioramas, Collector’s Editions … you name it. We have seen an incredible fan go to the length of paying $20,700 for the Epic Weapons’ Frostmourne sword replica (numbered #1), and the recent Blizzard Employees-Only Orc Wolfrider Bronze Statue which sold for $1,700 to benefit the Japan Relief cause. There’s no doubt in my mind there are fans out there with the strong conviction and resolve of getting ahold of these epic licensed loot like real life priceless treasures. For that matter, I have to bring forth this unique, mind-shattering, and breath-taking Bulk Collection offer to share it with fans. Someone who will remain anonymous contacted me last night to find out if I was interested in buying this. 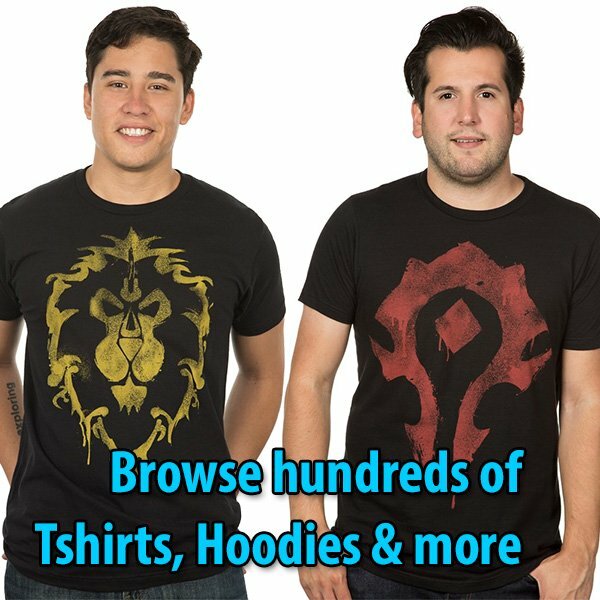 After all, Blizzplanet is a fansite that has reported news and previews of upcoming Blizzard Entertainment licensed products since 2002. I gasped when I saw this awesome collection, and sadly had to turn it down. I offered instead to share this with our visitors. Maybe someone out there will see the value of this bulk collection. I don’t know: any celebrities, doctors, lawyers, or someone with enough valor points. If you have $3,000 to steal this offer, post at this Facebook page, and the seller will reach you by Facebook unless the seller asks you to contact him by other means. I informed the seller to keep an eye on that facebook comments URL. The links below lead to other similar items that have been auctioned in the past years for your reference. I don’t have photos of all the products, only some of them the anonymous seller provided. I was told not all products in this bulk collection are mentioned below, so you might get more than you even bargained for as there are boxes of stuff only employees get. Check this page out in the next days in case I update with more images. I was offered more images of other products not listed here. However, not sure how long this bulk collection will last, so don’t hesitate contacting me to reach the seller with a good offer. I have a very exclusive collection of rare Blizzard Entertainment collectors items, many which have never been sold to the public and only offered to employees of the company. I’m looking to offload my entire collection for the listed price or best offer. Please keep in mind that the entire collection is worth more than the overall listed price as individual items. However, I’d like to clear everything out in one clean sweep if possible. I will also take offers on the individual items if the deal is right. Will welcome leads to specialized collectors as well. For any fan of the Blizzard Entertainment properties, you will see how rare and exclusive many of the items are. Please feel free to email with any questions. Other stuff not listed here — some of those in the photos below. There are boxes of stuff not listed which are part of the bulk collection.